Reef Club Cozumel 'The Most Fun ALL INCLUSIVE in Cozumel', located in one of the best and largest beaches of the island, located only 15 minutes away from downtown, 20 minutes from the airport and only a few minutes by boat to all the main reefs. 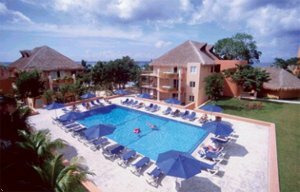 The hotel offers a relaxed and fun ambience with a wide variety of activities for all ages, most of them included in your room rate, and with 306 rooms and suites located in 27 Caribbean style villas all fully equipped. We have 3 restaurants and 4 bars for your convenience, where you can enjoy great international and Mexican Cuisine and unlimited drinks, beer and wine. Standard guest room with king bed or 2 double beds. Rooms are decorated in a Caribbean style and fully equipped with individual A/C, full bathroom, dressing area, ceiling fan, direct access telephone, satellite color TV with international programming, in-room safe Deposit box (at extra charge), balcony or terrace. Superior guest room with king bed. Beautiful honeymoon room with Jacuzzi in balcony or terrace, king size bed and fully equipped with individual A/C, full bathroom, dressing area, ceiling fan, direct access telephone, satellite color TV with international programming, in-room safe Deposit box (at extra charge). VIP studio room with king bed. Room includes a living area with queen sofa bed, fully equipped bathroom, kitchen appliances, mini refrigerator, ceiling fan, balcony or terrace, dining table and chairs, living area, independent A/C. Could be connected to a junior suite by an inside door. This room is category located in an exclusive area with it's own swimming pool, VIP treatment, Lounge and premium drinks bar for guests and exclusive restaurant a-la-carte. VIP junior suite with king bed. Suite includes separate living area with queen sofa bed, fully equipped with Jacuzzi in balcony or terrace, bathroom, kitchen appliances, mini refrigerator, ceiling fan, dining table and chairs, living area, independent A/C. Could be connected to a studio by an inside door. This room category is located in an exclusive area with its own swimming pool, VIP treatment, Lounge and premium drink bar for guests and exclusive restaurant a-la-carte. From the airport, take Main Street Rafael Melgar south, straight ahead up to the main highway Carretera Costera Sur in KM 12.9 the hotel is located. * La Casona - open 7am-11am (breakfast)..12:30pm-3:30pm (lunch)..6pm-10:30pm (dinner), casual, Mexican and International cuisine, buffet dining, friendly ambiance and a wide variety of dishes. * La Fente - open 6am-10pm, elegant dress..long pants required, Italian a-la-carte cuisine, perfect place for romantic dinners. * Vista del Mar - open 6am-10pm, elegant dress..long pants required, International and Specialties a-la-Carte dining, exclusive ambiance and the most delicious dishes. * El Marinero Snack Bar - open 11am-5pm..10:30pm-2am, casual, snacks..salad bars and bar service, open air Caribbean Palapa with the most fun ambience. 8 miles south to the property. 9 miles north to the property. 9 miles south to the property. 15 miles south to the property. 7 miles south to the property. 11 miles south to the property.